Jonathan Durden, the PHD co-founder who launched a male grooming brand last year, achieved a marketing coup during this year's Wimbledon fortnight using a Novak Djokovic pun. The Wimbledon champion, who successfully defended his title yesterday by defeating Roger Federer in the final, was the inspiration for the "Djockitch?" DOOH and print ad, which launched on July 3. The ad promotes Durden’s Below The Belt brand, which he launched in July 2014 with Geoff Percy, the former chief executive of Simple Health & Beauty. BTB offers three main products - Sports Lubricant, Fresh & Dry Balls, and Waterless Shower. 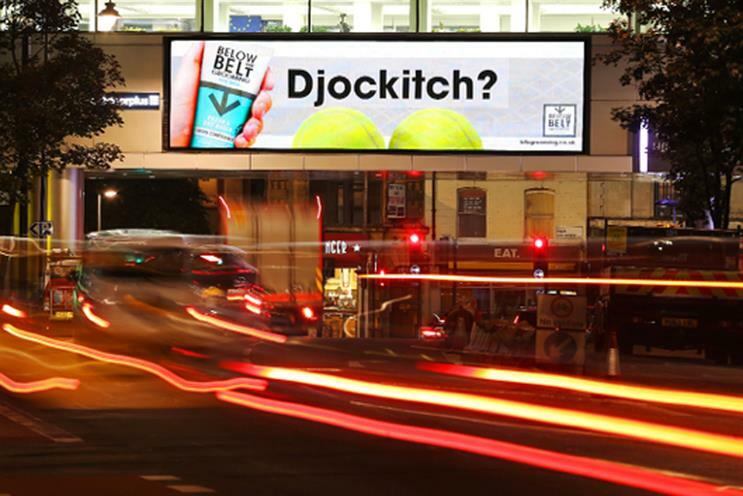 Newsworks, the Newspaper Publishing Association’s marketing body, has run an online poll that named "Djockitch?" as the overwhelming favourite among this year’s Wimbledon-related ads, with 79 per cent of the vote (at the time of publication). Ads for Rolex and Google came a distant second and third in the poll, receiving 8 per cent and 7 per cent respectively. Durden told Campaign that he conceived the ad during the heatwave in the first week of the Wimbledon Championships, when temperatures reached 36.7 degrees in west London on Wednesday, 1 July. He said: "It was done extremely quickly on the hoof. It was such an extremely hot day and Djokovic was about to play… I just thought: ‘I’ve got to make this happen’." Durden then commissioned Moreish to "knock up an ad immediately" and Outdoor Plus, to display the ad on digital screens on the following Friday morning. The ad has since appeared in online display ads and in the Daily Telegraph's Wimbledon section in print and online. He said: "The joy of digital posters and online is that you can put it out there that quickly. You can go from the idea to execution in one-and-half days." He also revealed that a second ad was planned for if Djokovic was defeated, called "No Djockitch". Given that the Serbian tennis star has won his last 14 matches at Wimbledon over the past two years, it may be a while yet before that opportunity comes along.